What is Saint Francis of Assisi the patron of? Who or what is Saint Francis of Assisi the patron saint of? Saint Francis of Assisi is the patron of Animals and Birds. Meanings, definition and origins - a patron is considered to be a defender of a specific group of people or of a nation. There is a patron for virtually every cause, profession or special interest. Prayers are considered more likely to be answered by asking a patron for intercession on their behalf. The story and history of Saint Francis of Assisi. Francis Bernardone was born the son of Pietro di Bernardone, a rich cloth merchant in Assisi in Italy. He led a wealthy and privileged life, wearing clothes made of the best materials and was well educated. With a future guaranteed in his father's business some of his youth was mis-spent. His experiences as a soldier, during which time he was a prisoner of war, led him to a more sombre and religious life. He undertook a pilgrimage to Rome and returned to Assisi following spiritual visions and mystical experiences. He decided to devote his life to the Christian faith and renounced all of his wealth preferring to lead a life of poverty. 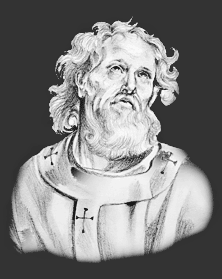 His evangelical preaching inspired others to follow him and in 1209 Francis and his first followers went to Rome to ask permission from Pope Innocent III to found a new religious order. The pope agreed and Francis d'Assisi became the founder of the Franciscan Order of Preaching Friars. He was said to have preached to birds and animals which explains his association with nature and all of God's creatures. Francis of Assisi is also famous for the Canticle of Brother Sun and Sister Moon. Saint Francis of Assisi died in 1226 of natural causes. There are two categories of saints: martyrs and confessors. A Christian martyr is regarded as one who is put to death for his Christian faith or convictions. Confessors are people who died natural deaths. Date of Death: Saint Francis of Assisi died in A.D. 1226. Cause of Death of Saint Francis of Assisi: Natural Causes. Why is Saint Francis of Assisi the patron of Animals and Birds? Why is Saint Francis of Assisi is the patron of Animals and Birds? Because of the respect Saint Francis of Assisi gave to all God's creatures. It is helpful to be able to recognise Saint Francis of Assisi in paintings, stained glass windows, illuminated manuscripts, architecture and other forms of Christian art. The artistic representations reflect the life or death of saints, or an aspect of life with which the person is most closely associated. Saint Francis of Assisi is represented in Christian Art with a lamb and a lily, the emblems of meekness and purity, and the stigmata, or five wounds of the crucified Christ. We are told in the legend that it was manifested to him in his cell that he should be transformed into a resemblance to Christ, "not by the martyrdom of the flesh, but by the might and fire of Divine love." When the vision had passed away, he discovered that in his hands, feet, and side he carried the wounds of the Redeemer. The Feast Day of Saint Francis of Assisi is October 4th. The origin of Feast Days: most saints have specially designated feast days and are associated with a specific day of the year and these are referred to as the saint's feast day. The feast days first arose from the very early Christian custom of the annual commemoration of martyrs on the dates of their deaths at the same time celebrating their birth into heaven.